Dutch explorer Peter Minuit landed on present-day Manhattan Island, and purchased Manhattan from the resident Algonquin Indians for the equivalent of $24 in cloth, beads and baubles. R. Luther discovered asteroid #258 Tyche. A. Charlois discovered asteroid #416 Vaticana. The first balloon flight to an altitude over 40,000 feet was made by US Air Corps Capt. 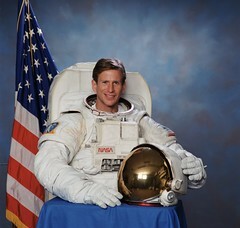 Hawthorne C. Gray from Scott Field, Illinois, achieving a world record height of 42,740 feet (13,027 meters, 8.09 miles). Malcolm Ross and Victor Prather reached a record altitude of 34,668 meters (113,740 feet, 21.5 miles) in the Strato-Lab V balloon. The absolute altitude record for balloonists returning to Earth with the balloon has not been broken as of 2018. The first on-the-road Spacemobile lecture was given. The Spacemobile Program was an activity that demonstrated NASA's commitment to aerospace education for the schools and the general public. KSC sponsored two vans, which covered Florida and Georgia. Other NASA Centers covered different parts of the country. These units, manned by experienced teachers, came equipped with models, dynamic exhibits, films, slides and other visual aids. In effect, the aerospace specialists operating the vans took the classroom to the student, working with teachers and school science departments throughout the region to bring space technology directly to the students. In a typical year, the two KSC Spacemobile lecturers reportedly conducted some 1,200 demonstrations involving more than 250,000 students. The last data was received from NASA's Surveyor 3 spacecraft on the Moon. Surveyor 3, launched 17 April 1967, was the second spacecraft in the Surveyor series to acheive a soft landing on the Lunar surface. The main purpose of the mission was to determine various characteristics of the Lunar terrain in preparation for Apollo Lunar landing missions. Equipment on board included a television camera and auxiliary mirrors, a soil mechanics surface sampler, strain gages on the spacecraft landing legs, and numerous engineering sensors. The spacecraft landed on the Moon at 3.01 deg S latitude, 23.42 deg W longitude in the southeastern part of Oceanus Procellarum at 00:04:53 UT on 20 April 1967 (19 April 19:04:53 EST). Touchdown on the Lunar surface occurred three times because the Vernier engines continued to fire during the first two touchdowns causing the spacecraft to lift off the surface. A large volume of new data on the strength, texture, and structure of Lunar material was transmitted by the spacecraft, in addition to the Lunar photography transmission. The last data were returned on 4 May 1967. On 19 November 1969, the Apollo 12 Lunar Module (LM) landed within about 180 meters of the Surveyor 3 spacecraft. Astronauts Pete Conrad and Alan Bean visited the earlier spacecraft on their second moonwalk on 20 November, examining Surveyor 3 and its surroundings, taking photographs, and removing about 10 kg of parts from the spacecraft, including the TV camera, for later examination back on Earth. The Surveyor 3 camera is now on display in the Smithsonian National Air and Space Museum in Washington, D.C.
NASA launched Lunar Orbiter 4, a Moon mapping orbiter, to perform a broad systematic photographic survey of Lunar surface features . NASA launched LAGEOS 1 to aid measuring shifts of continental land masses by reflecting laser beams off its refecting mirrors. LAGEOS (Laser Geodetic Satellite) was a very dense (high mass-to-area ratio) laser retroreflector satellite which provided a permanent reference point in a very stable orbit for such precision Earth-dynamics measurements as crustal motions, regional strains, fault motions, polar motion and Earth-rotation variations, solid Earth tides, and other kinematic and dynamic parameters associated with earthquake assessment and alleviation. In conjunction with appropriate laser-tracking systems, LAGEOS permitted extreme precision-ranging measurements for both geometric mode (multilateration) and orbital dynamic mode determinations of positions of points on the Earth. 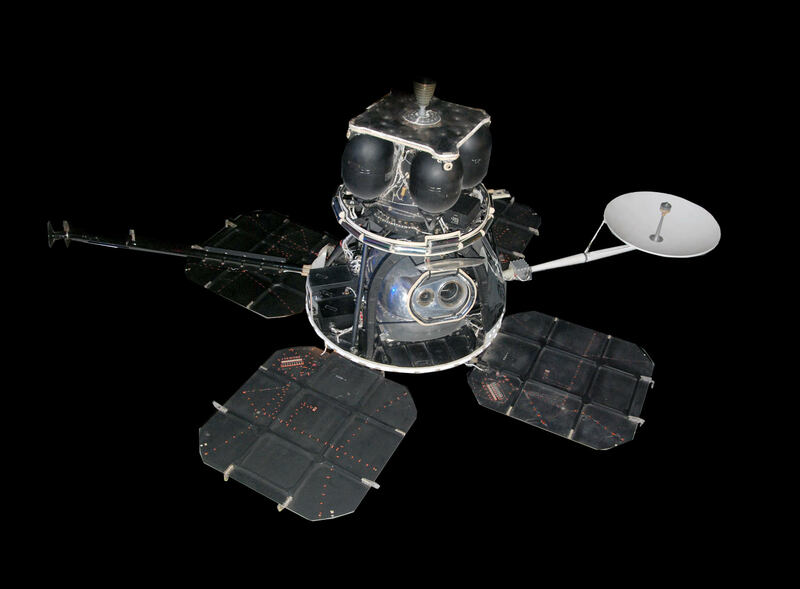 It was the first spacecraft dedicated exclusively to high-precision laser ranging and provided the first opportunity to acquire laser-ranging data that were not degraded by errors originating in the target satellite. The high-accuracy range measurements from this permanent-orbiting reference point were used to accomplish many extreme precision Earth-dynamics measurements required by the earthquake hazard assessment and alleviation objectives of the Earth and Ocean Physics Applications Program (EOPAP). The performance in orbit of LAGEOS was limited only by degradation of the retroreflectors, so many decades of useful life can be expected. The high mass-to-area ratio and the precise, stable (attitude-independent) geometry of the spacecraft, together with the orbit, made this satellite the most precise position reference available. Because it is visible in all parts of the world and has an extended operation life in orbit, LAGEOS can serve as a fundamental standard for decades. NASA launched FltSatCom 2 for the US Department of Defense. FLTSATCOM 2, launched 4 May 1979, was the heaviest communications satellite the United States had attempted to orbit, exceeding the previous leader, TACSAT-1, by over 250 lbs. The FLTSATCOM (Fleet Satellite Communications) communications satellite system served as a world-wide UHF communications link among US Navy aircraft, ships, submarines, and ground stations. The high capacity spaceborne communications system gave the Navy both shore-to-fleet and single-way communication among ships, aircraft, and submarines separated by distances exceeding line-of-sight UHF ranges. The satellite provided 30 voice channels and 12 teletypewriter channels simultaneously in UHF. A number of channels were reserved for high-priority US Air Force ground-to-air communications with Strategic Air Command aircraft, the E-3A airborne warning and control system, and elements of the Presidential command structure. Unlike most military and commercial communications satellites, the FLTSATCOM satellites used a triaxial stabilization system utilizing a reaction control wheel assembly instead of spin stabilization. Electrical power was provided by 2 three-section solar panels mounted on booms extending from the satellite body and unfolded in space. Nickel-cadmium batteries provided power during solar eclipses. The USN and USAF planned to orbit four satellites, including one as an on-station spare, positioned around the world in near-equatorial geosynchronous orbits to provide near-global coverage. T. Furuta discovered asteroid #2478 Tokai. Dave Kingman hit a fly ball that never came down. It didn't go into orbit, however - it stuck in the Metrodome's ceiling. NASA launched STS 30 (Atlantis 4, 29th Shuttle mission) carrying the Magellan/Venus Radar Mapper spacecraft to orbit, the first US planetary mission in 11 years, and the first carried into orbit on the Shuttle. The STS 30 launch on 28 April 1989 was scrubbed at T-31 seconds due to a problem with the liquid hydrogen recirculation pump on the number one main engine and a vapor leak in a four inch liquid hydrogen recirculation line between the orbiter and the external tank. Repairs were made and the launch was reset for 4 May 1989. Liftoff was delayed until the last five minutes of the 64 minute window due to cloud cover and high winds at the Kennedy Space Center Shuttle runway, violating return-to-launch site limits. The primary payload aboard STS 30, the Magellan/Venus radar mapper spacecraft and its attached Inertial Upper Stage (IUS), were deployed six hours, 14 minutes into the flight. The IUS first and second stage fired as planned, boosting the Magellan spacecraft on the proper trajectory for its 15 month journey to Venus. Magellan was the first US planetary science spacecraft launched in eleven years, and the first to be carried into space aboard a Shuttle. The secondary payloads on STS 30 were: the Mesoscale Lightning Experiment (MLE), microgravity research with the Fluids Experiment Apparatus (FEA), and the Air Force Maui Optical Site (AMOS) experiment. One of the five general purpose computers (GPC) failed and had to be replaced with a sixth onboard hardware spare. This was the first time a GPC was switched on orbit. STS 30 ended 8 May 1989 when Atlantis landed on revolution 65 on Runway 22, Edwards Air Force Base, California. Rollout distance: 10,295 feet. Rollout time: 64 seconds. Launch weight: 261,118 pounds. Landing weight: 194,789 pounds. Orbit altitude: 184 nautical miles. Orbit inclination: 28.8 degrees. Mission duration: four days, zero hours, 56 minutes, 27 seconds. Miles traveled: 1.7 million. The orbiter returned to Kennedy Space Center on 15 May 1989. The flight crew for STS 30 was: David M. Walker, Commander; Ronald J. Grabe, Pilot; Norman E. Thagard, Mission Specialist 1; Mary L. Cleave, Mission Specialist 2; Mark C. Lee, Mission Specialist 3.